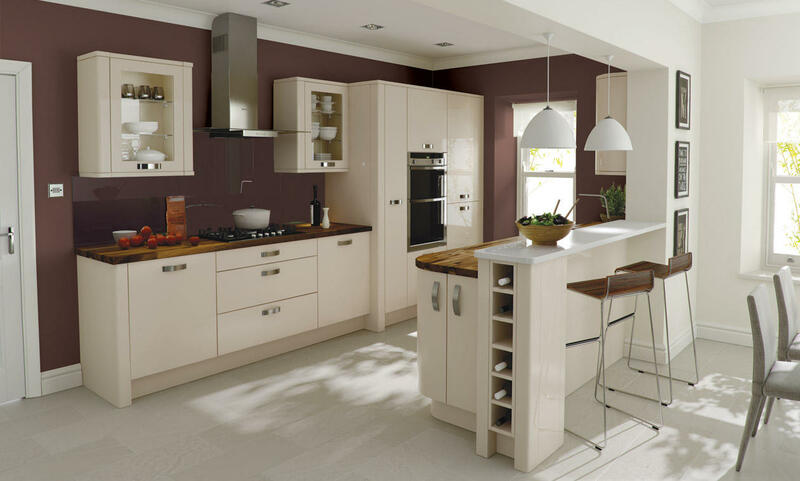 If you want a kitchen design that is as stylish as it is practical, then you need look no further than the Porter Beige. This beautiful and glossy contemporary shaker-style kitchen will simply blow you away. Not only is it incredibly aesthetically pleasing, with a stunning lacquered finish to the cupboard doors ensuring your kitchen is positively gleaming, but it’s also incredibly practical too. As with all classic shaker kitchens, with the Porter Beige contemporary kitchen you’re getting a multitude of storage opportunities. From cupboards to drawers and cabinets too, you’ll find that everything in your kitchen has a home. The cupboards come in a host of different finishes, with a curved design available so that you can craft the perfect Porter kitchen to meet the space of your room. Not only that, but you can also opt for cupboard doors with a transparent glass panel so that you can show off your finest kitchen accessories and crockery. Whilst we’re discussing customisable options with your Porter Beige contemporary kitchen, it’s also worth mentioning that the colour palette is completely in your control. We’ve chosen beige in these images to act as the perfect neutral shade for a kitchen design, but you have 27 different colours to pick from, each available in both a high-gloss and a matte finish, depending on your personal taste. We’ve chosen a Walnut finish for the main worktop to accentuate the beige colour palette, combining it with a white Silestone Quartz breakfast bar to create an additional surface space for food preparation, dining and entertaining. The choice of your surfaces is also up to you, so you can choose a contrasting worktop or something a little closer in colour to your cupboard doors to create a seamless finish. The full height splashback you can see in the kitchen adds a practical element to your space whilst simultaneously contributing to the design aspect of your new Porter Beige contemporary kitchen.